Yeah 1 Regt AAC moved to Yeovilton in 2014 from Gutersloh. Around the same time 9AAC disbanded I believe. Ye, would be a nice feature indeed. A shame the Army refuses to use the LMM on their Wildcat but I bet as soon as a war brakes out they will be strapping them on in next to no time. I asked the same question (albeit hellfire or it’s replacement) of the Colonel commanding the ARF. Quite simply had they done that the Apache E model purchase could have been lowered. We discussed the Kiowa/Apache teaming concept as that’s what we’ve started doing with WC (nothing new to Gz/Lynx teaming back in ‘91). Ye, most likely a cost-cutting exercise but one that did make a little sense (unlike most of them) since they could then take the engines from them and put them straight into the new WCs. It was cost saving for the Army/AAC. Lost the liability of the SF Sp Sqn (657). The RAF with Puma force taking up that mantle. Manpower could then be reallocated to other units that held significant gaps. There’s a lot of commonality between them. The AFCS computer is the same as the Mk1!! One of the most notable changes are the main texture resolution which have been increased from 1024x1024 to 2048x2048 (four times the texture size/detail) while only slightly increasing the overall memory usage. I worry, this change may affect those with video cards where supersampling is be enabled, there sheets are multiplied by a factore of x2 or more... requiring more vRAM. Also, have you considered the possibility of pixelation / texture shimmering, if mip LOD isn't adjusted accordingly in BF2 editor? IF not this adjustment will need visual testing so to arrive at a mip LOD level that coinicides with existing 1024 sheets that make up majority of PR. The lynx can be a one-off becuase the work has already been done but everything else, in development, present and future, I urge for the entire PR modding/dev community to agree upon and eventually set a standard (re: mip size) for future devs to abide, to prevent futrther 'deviation' and in turn maximising consistency across PR. Consider that potentially, time may be wasted in future with descendant devs updating older additions, from 2014, to align with the standard as set by this Lynx, 2048. I just think the community would be shooting itself in the foot, adding more work where its unessesary... It's an old game and some texture improvments aren't going to stack up to modern AAA titles anyway. PR has a certain character. Attempting to 'improve textures is futile in a way. I've actually had this re-arrangment proposal in mind for a while now but never had / saw the opportunity to act, until I seen you mentioned 2048 mips on your here blog. Hopefully my concern makes sense.... I'd like your input. What prompted me to think of re-arrangement initially, was the observation that High texture setting had been greyed out on 32-bit systems in an update (1.4?). Like I say, I suspect what led to this change was a combination of things: devs being too liberal with textures, the limitations of 32bit systems and the recent advent of supersampling, on by default on newer video cards (people were having excessive CTD due to lack of vRAM, that I am certain of). Either way, I'd like to see the setting option return. Perhaps include a notice next to the High option, instead of disabling the option outright. I would like to test High on 32 but can't currently (at least not under normal conditions, i.e. without force of /3gb switch). Thanks and good work as always. Last edited by WeeGeez; 2019-03-07 at 23:45..
2048 use to be the standard of all our vehicles in PR, the Lynx was in fact originally released with 2048 textures but around v0.9, maybe a bit later, we had gotten to the point where players were simply running out of memory to load all the textures and they would crash on map load as a result of it. As for memory, as long as we are not going over the memory limit of the 32bit BF2 engine then we don't really have to worry about anything, especially with the modern GFX cards most players have and for those who don't, they can always run on lower settings. 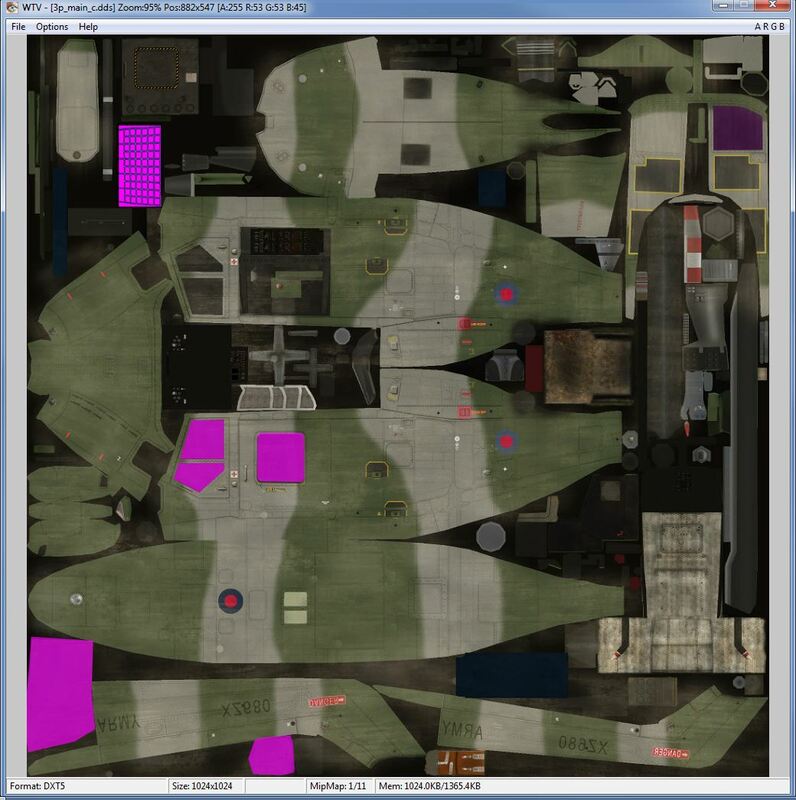 To put the memory increase into context the 3rd person (1p textures are only loaded when you enter the vehicle), Lynx AH7 textures (not including _woodland variations loaded at the same time, since either or would be loaded), including all the extras attachments (air filters, MGs stands etc) as of ~v1.3 where 3.50mb and with the increased 2048 rez for the diffuse, higher rez rotor blur textures they now come to 4.79mb, an increase of 1.29mb, 37% for textures that look four times the detail as the old ones, even if some of the lesser obvious textures (normal and spec) are still of the same rez they where before. 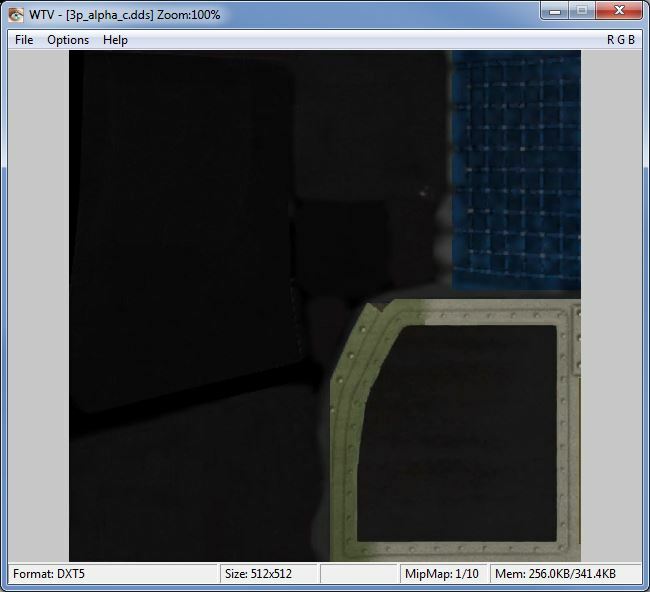 Since I don't have the v0.85 textures to hand I can only estimate based off the original uncompressed textures I have that the original compressed .dds textures as of v0.85 would have come to around 12.32mb for the same selection as above, with all diffuse, normal, spec and opacity being saved in 2048 and in DXT5, with the extra bits on top being saved at full rez in DXT5 too. 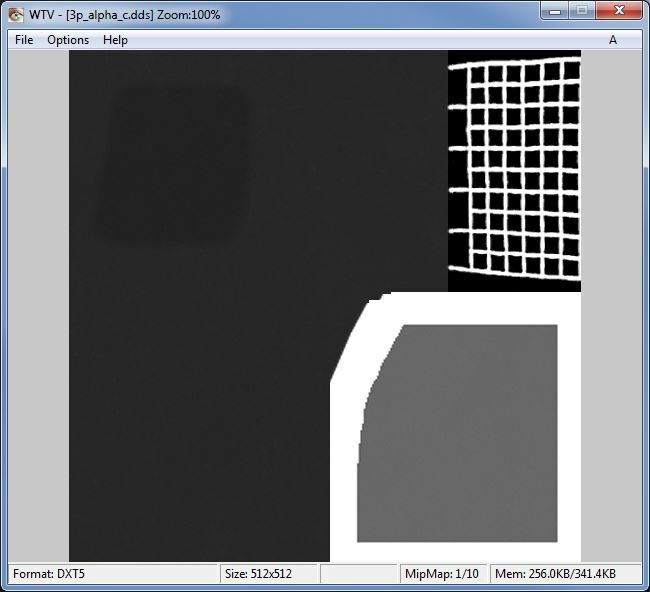 Might have been a little less since the rotor blur texture might have been 256 rather than the estimated 512. Also worth noting that as per the OP, the Lynx has been like this since v1.4 and many other vehicles have had this texture setup for longer than that and not seen any reports of issues of the textures for players. Unless by Mips you mean pixel detail per meter on the highest mip? We don't actually have a standard in PR for that tbh, although tbh in hindsight we really should have set one a long time ago but it is really too late to be worth it now. The general rule of thumb now is just every new vehicle made or any old ones being optimized, to make them in this general, optimized format but no exact pixel per meter detail, just as much as is sensible without going all "4k texture crazy" just because you can as then we will end up with players running out of memory on loading again. 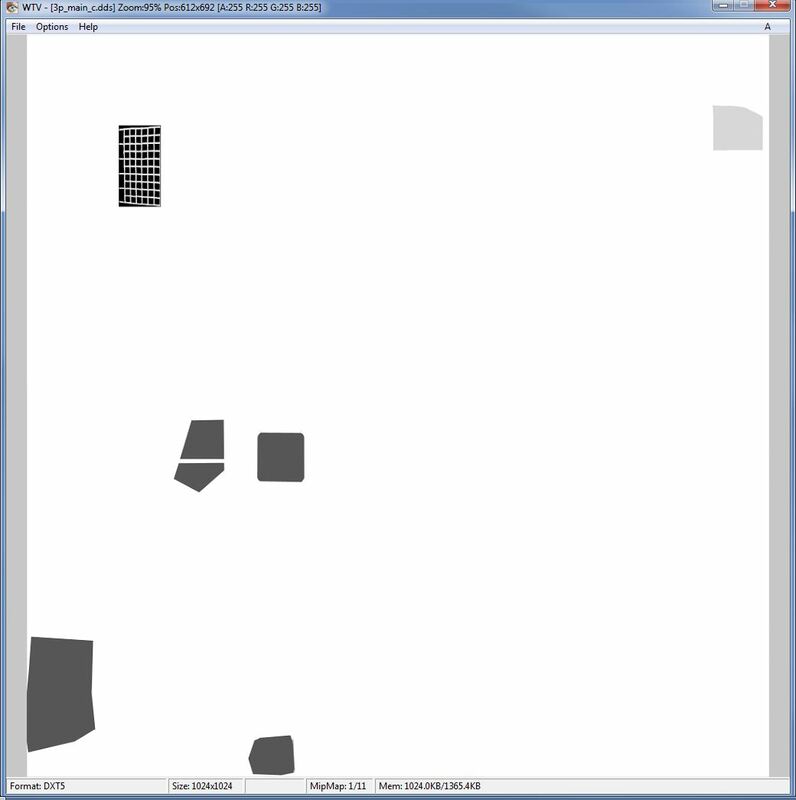 As for having gfx settings for different texture rez sizes, I'm not sure if we can do that with the BF2 engine, not my department but my guess is that sort of thing is hardcoded into the engine. What prompted me to think of re-arrangement initially, was the observation that High texture setting had been greyed out on 32-bit systems in an update (1.4?). Effects, not textures, were forced to High, because like a couple of other settings that are locked down, having Effects on Medium/Low gave gameplay advantages. In turn the actual effects themselves were optimized. Nah. I can assure you on x86 systems, texture quality setting HIGH cannot be selected, and this has been like this since 1.4 I believe. I do not know who implimented this change or why but I was hopeing for it to be changed back for testing purposes.... I repeat, it has nothing to do with forced effects settings. It's texture quality. I suspect it was done due to avalanche of complaints regarding CTD on forum shortly after newer maps with bloated somethings were added. (though maybe they've now since optimised, the setting stayed unchanged).